Premixed Henna stains the skin a Brownish/Orange to Mocha Color, and lasts anywhere from 1-3 weeks. NOTE: The FDA has NOT approved henna for use on skin. Do not apply on children under six OR apply on Broken Skin, OR Near the Eyes/Mouth. 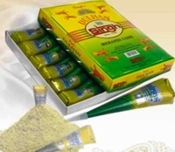 Ingredients: 100% Pure Henna Powder, Lemon Juice, Sodium Preservatives & Essential Oils. 2/3 oz. 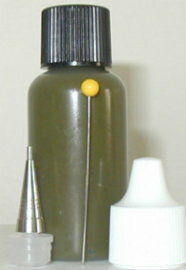 Premix Bottle of Natural Henna w/ Metal Applicator Tip. Contents Include: 2/3 oz. (net weight) of Premixed Natural Henna (enough paste to do 20-25 designs) - Flexible/Squeezable Applicator Bottle & Metal Applicator Tip - Instructions/Aftercare. Contents Include: - 2/3 oz. (net weight) of Premixed Natural Henna (enough paste to do 20-25 designs) - Flexible/Squeezable Applicator Bottle - Metal Applicator Tip (ideal for fine line work) - Essential Oil - 2 Sheets of Designs - 13 Stencils - Pin (for clogs) - Instructions/Aftercare - Plus other Misc. Items. 1.5 oz. Premix Bottle of Natural Henna w/ Metal Applicator Tip. Contents Include: 1.5 ounces (net weight) of Premixed Natural Henna (Enough Paste to do 25-30 Designs) - Flexible/Squeezable Applicator Bottle - Metal Applicator Tip - Instructions/Aftercare. Contents Include: - 1.5 ounces (net weight) of Premixed Natural Henna (enough paste to do 25-30 designs) - Flexible/Squeezable Applicator Bottle - Metal Applicator Tip (ideal for fine line work) - Essential Oil - 2 Sheets of Designs - 13 Stencils - Pin (for clogs) - Instructions/Aftercare - Plus other Misc. Items. Contents Include: 2.5 ounces (net weight) of Premixed Natural Henna (Enough Paste to do 50-60 Designs) - Flexible/Squeezable Applicator Bottle - Metal Applicator Tip - Instructions/Aftercare. Contents Include: - 2.5 ounces (net weight) of Premixed Natural Henna (enough paste to do 50-60 designs) - Flexible/Squeezable Applicator Bottle - Metal Applicator Tip (ideal for - Essential Oil - 2 Sheets of Designs - 25 Stencils - Pin (for clogs) - Instructions/Aftercare - Plus other Misc. Items. Contents Include: 2.5 ounces (net weight) of Premixed Natural Henna (Enough Paste to do 50-60 Designs) - Flexible/Squeezable Applicator Bottle - 5 Metal Applicator Tips - Instructions/Aftercare. Use this Large bottle of Premix to Transfer Henna Paste to smaller Applicator Bottles or Cones! Contents Include: - 5 oz. (net weight) of Premixed Natural Henna (Enough Paste to do 100-200 Designs) - Flexible/Squeezable Applicator Bottle - Metal Applicator Tip - Instructions/Aftercare. Contents Include: - 5 ounces (net weight) of Premixed Natural Henna (enough paste to do 100-200 designs) - Flexible/Squeezable Applicator Bottle - 9 mm Metal Applicator Tip (ideal for fine line work) - Essential Oil - 4 Sheets of Designs - 40 Stencils - Pin (for clogs) - Instructions/Aftercare - Plus other Misc. Items. Use this Large bottle of Premix to refill your Applicator Bottles or Cones! Contents Include: - 11 oz. (net weight) of Premixed Natural Henna (Enough Paste to do 400-500 Designs) - Instructions/Aftercare. Contents Include: - 11 ounces (net weight) of Premixed Natural Henna (enough paste to do 400-500 designs) - Flexible/Squeezable Applicator Bottle - 9 mm Metal Applicator Tip (ideal for fine line work) - Essential Oil - 4 Sheets of Designs - 40 Stencils - Pin (for clogs) - Instructions/Aftercare - Plus other Misc. Items. Use this Large bottle of Premixed Henna to refill your Applicator Bottles or Cones! Contents Include: - 14 ounces (net weight) of Premixed Natural Henna (Enough Paste to do 600-700 Designs) - Instructions/Aftercare and other Misc. Items. Contents Include: - 14 ounces (net weight -) of Premixed Natural Henna (enough paste to do 600-700 Designs) - Applicator Bottle - 9 mm Metal Applicator Tip (ideal for fine line work) - Essential Oil - 6 Sheets of Designs - 50 Stencils - Pin (for clogs) - Instructions/Aftercare - Plus other Misc. Items. Use this Large bottle of Premixed Henna to refill your Applicator Bottles or Cones! Contents Include: - 22 ounces (net weight) of Premixed Natural Henna (Enough Paste to do 1000+ Designs) - Instructions/Aftercare and other Misc. Items. Contents Include: - 22 ounces (net weight -) of Premixed Natural Henna (enough paste to do 1000+ designs) - Applicator Bottle - 9 mm Metal Applicator Tip (ideal for fine line work) - Essential Oil - 6 Sheets of Designs - 60 Stencils - Pin (for clogs) - Instructions/Aftercare - Plus other Misc. Items. Contents Include: - 1 Gallon of Premixed Natural Henna.